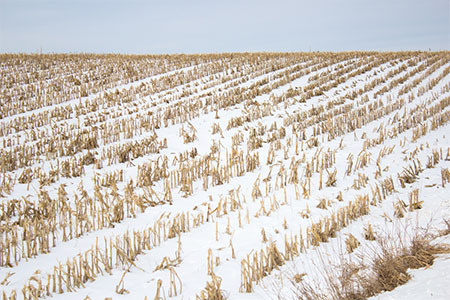 If my soil is frozen but there is no snow can I safely apply fertilizer? It depends on how much precipitation might occur the future. Solid surfaces pose a significant risk for loss if any precipitation event, rain or snow, happens while the ground is still frozen. To avoid economic risk, wait to apply any fertilizer until the soil thaws enough to incorporate the fertilizer, or at a point where the nutrients can react with the soil. If I need to make multiple fertilizer passes this spring what are my options? With phosphorus and potassium, use your soil tests. For high and very high soil tests, it’s not likely that P and K will be short. Any P or K that’s needed can be applied in-furrow as a starter if that option is available. Mobile nutrients like nitrogen or sulfur are more critical for corn production because of the crop’s level of response to these nutrients. Without P and K application soil tests may decline but the impact of not applying removal of these nutrients will not likely impact crop production in the short term. In most cases nitrogen and sulfur application can be delayed until after planting to allow for spring application of phosphorus. The nitrogen contained with the phosphorus in fertilizer sources used should be sufficient until an early side-dress application of N is made. When making fertilizer decisions, always err on the side of caution. Time is always a limiting factor with spring application, but applying too early increases your risk for nutrient loss and affects your bottom line. Don’t end up paying for inputs that won’t be available for the crop when it needs it most.